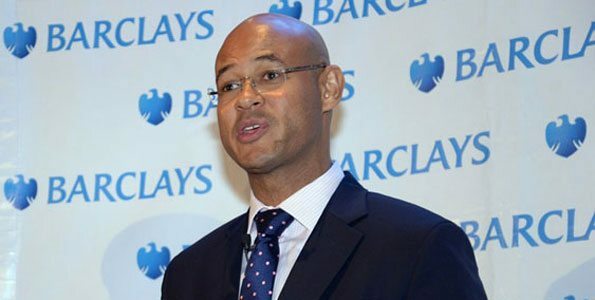 Mr. Jeremy Awori has served as Managing Director, Executive Director, and Chief Executive Officer (CEO) of Barclays Bank of Kenya Ltd for the the past five and a half years. He joined Barclays bank on February 1, 2013. Over this period, Mr. Awori has steered Barclays towards profitability amidst rising competition in the banking sector. With a staff complement of approximately 4,000 people operating across a 120 branch network countrywide, Mr. Awori has revolutionized Barclays from its an old assumption that it is a bank for the urban and upmarket customer, to a bank that is accepted by customers from different walks of life across the country. “I am the accountable executive for Barclays Bank Kenya Subsidiaries which include the Barclays Financial Services, Barclays Bank Insurance Agency, Barclays Microfinance, and Barclays Nominees Ltd,” he says. 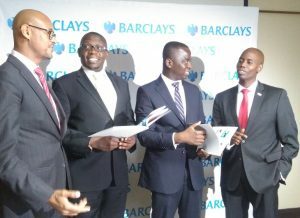 Barclays Bank CEO Jeremy Awori, Nairobi Securities Exchange CEO Geoffrey Odundo, Barclays Bank MD George Asante and Capital Market Authority CEO Paul Murithi during the launch of Barclays Africa group financial market index 2017. Prior to joining Barclays Bank of Kenya as its head, Mr. Awori held several senior executive positions at Standard Chartered Bank, including Chief Executive Officer and Managing Director of Standard Chartered Bank, Tanzania and, prior to this, as Regional Sales & Performance Director for Standard Chartered Bank, Dubai in the United Arab Emirates. From 2006 to December 2008, Mr. Jeremy Awori was the regional sales ad performance director at the Standard Chartred Bank. Between June 2013 and June 2014, Mr. Awori served as the chairman of the Kenya Bankers Association. He holds a Bachelor’s in Pharmacy from the University of Manchester, which he undertook from 1989 to 1991 and two Masters of Business Administration from INSEAD and from McGill University, which he undertook from 1994 to 1996. Mr. Awori has won several accolades among them The Banker Magazine – Bank of the Year in Tanzania 2010, Euromoney – Best Bank in Tanzania 2011, The Banker magazine – Bank of the year in Tanzania 2011,EMEA Finance – Best foreign bank in Tanzania 2012. In the advent of mobile banking, Mr. Awori has been central in the bank’s adoption of internet banking. He recently led the bank in the launching of the most advanced mobile lending app in Kenya dubbed ‘Timiza’. The app is allowing Kenyan consumers to apply and get instant loans based on the strength of the M-Pesa transactions, and irrespective of whether they are Barclays Bank customers or not. Over the time he has been at the helm of Barclays, the bank has been steadily profitable. In the first quarter of 2018, the bank posted a net profit of Sh. 1.8 billion, which represented a growth margin of 7.5 per cent.